There is no other state in the country, outside of Alaska, that has more wintering bald eagles than Illinois. An estimated 3,100 call our land home for a brief time, usually beginning in December and remaining until they head back north in March. Lucky for us, Clinton County is one of the main places eagles love to hang out, and February is a prime time to spot them. This Saturday morning, February 9, 2019, you can join an Eagle Watch at the Carlyle Lake Main Dam. Sponsored jointly by the U.S. Army Corps of Engineers and Case-Halstead Library, those interested can also take part in the program in the warmth of the Library. The World Bird Sanctuary will be presenting a Bald Eagle Demonstration at the Library and there will crafts for the kids as well. Kids’ crafts begin at 8:30 a.m. If you want to look for eagles at other times this winter, there are several great locations to go to, such as the General Dean Bridge area at the east end of Carlyle. You can walk along trails on either bank of the river there. Several areas at Carlyle Lake also offer good viewing, including the Dam West Boat Ramp parking area, picnic area, and on top of the dam. 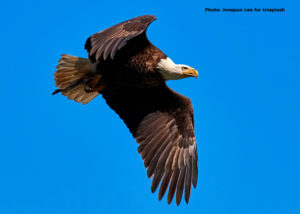 The North Fork and East Fork areas on the east side of Carlyle Lake would be other good eagle-spotting locations. So dress warmly, pack your camera or smart phone, and take advantage of this unique opportunity to see one of the world’s most magnificent raptors. Just one more reason we love Clinton County! This entry was posted in Events, Outdoor activities, Winter and tagged Carlyle Lake, Clinton County attractions, Clinton County event, Clinton County tourism, outdoor activity by admin. Bookmark the permalink.